Trekaroo? Superoo? What does that even mean? Trekaroo is a family travel tips and review website that my friend Marissa introduced me too about a year ago. The site offers user submitted reviews of hotels and attractions in different cities around the US. Anyone can join and it’s totally free! 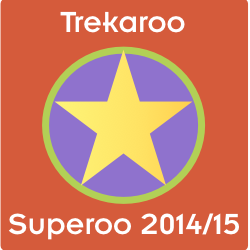 A Superoo is a parent who joins the Trekaroo team to provide travel advice and help share the love of Trekaroo. Moms and Dads around the US who like to travel (alone or with their kids) are invited to access new hotels, attractions and special events so they can share these places with you. Guess who is on the Superoo team for 2014-2015?? Me and about 100+ other moms and dads around the US. I am so excited to join the team and start sharing some of our adventures with you. If you’ve follow me for a while you know that we love to travel. Just this year we’ve been on a cruise to Cozumel and Grand Caymen. Last week we were in Palm Beach and next week the hubs and I are sneaking away to Vegas while the kids are on vacation with the grandparents. Yes, we love to travel!! Head on over to Trekaroo and take a look around. Set up an account or just lurk through our reviews. You can see some of the places I’ve visited (on my own before becoming a Superoo) over the past few years. I’m Calley @TheEcoChic on Trekaroo so it should be hard to find me. While you’re there, check out my friend Marissa (TampaMama) and Denise (RunDMT) and the rest of the 2014-15 Superoo Team! Where will I go next? I have no idea! Maybe I’ll get to check out some new beaches in Florida? Maybe I’ll get to see some sneak peek new attractions (oh….Universal Studios Diagon Alley is opening soon) or visit someplace I’ve never dreamed of. Do you love to travel? Do you take the kids along when you do? Which destinations are on your must-see list?